Things are about to get crazy around these parts! It’s hard to believe that the near 18 month journey is about to culminate in the release of my first cookbook. I’ve seen the finished product and it is absolutely gorgeous. I couldn’t be happier with it. Honestly. The photography (from by my dear friend Kim Box) is unbelievable. The hand lettered cover (by the team at Juice Box Designs) is amazing. And I hope that you find the recipes inside just as tasty as the book is beautiful. I put so much of myself in this book and I just can’t wait to share it with y’all. It’s a bit scary, too. I know there will be criticism – we all can’t see things the exact same way. And I know there will be those negative reviews out there. But sharing my food with the world is my dream and all of this “stuff” is just part of it. And none of this would have been possible without the absolutely amazing folks at Thomas Nelson and Nelson Books. I never could have imagined a better group of folks to work with. What started as a business relationship has ended in friendship. Who could ask for more than that? Only 14 days left to pre-order. And trust me… if you want to get a copy, you should pre-order. Seriously. Pre-order. You’ll know why in just a few days. It’s exciting. I promise. 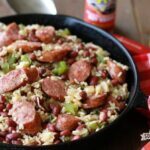 With Mardi Gras season in full swing, I wanted to share another one of my favorite creole/cajun recipes. This quick and easy Red Beans and Rice is ready in less than an hour and has all the great flavor of the slow cooked variety. The best part is it’s all done in one pot! I don’t know about you, but those types of recipes that don’t dirty up everything in the kitchen are my absolute favorites. Y’all enjoy! Add the vegetable oil to a large dutch oven over medium heat. Add the sliced sausage and cook for 4 to 5 minutes. Add the onion, green pepper, and celery. Cook 7 to 8 minutes, or until the onions are translucent. Add the garlic and cook until fragrant, about 1 minute. Add the broth and bring to a boil over medium-high heat. Stir in the beans and rice. Reduce the heat to a simmer and add creole seasoning to taste. Cover and cook for 12 to 15 minutes, or until the rice is tender. mmmmm MMMM!! Delicious! Thanks Stacey! This sounds delicious! And, I am looking forward to your cookbook! Could you use brown rice for this? I guess you would have to just cook it longer? Sure! You can even use instant brown rice. This looks so yummy and easy to prepare. I’m making this tonight! Just found you via Facebook. This looks wonderful. It’s a rainy day here in Southern California, so I’m making it tonight! Thank you! I’m making this tonight for the second time in less than a week – at my husband’s request. It is so good, and so simple, and comes together in a hurry! Wonderful! That’s the best compliment I could get! So glad y’all are enjoying the recipe. Do u have to use a Dutch oven? Or can I just use a large pot? Want to make this, but don’t own a Dutch oven. Had this for dinner tonight and was absolutely delicious!!. Will be making this again and thank you for sharing such wonderful recipes.!!! Wonderful, Lorraine! I’m so glad you liked it so much!! Thanks for letting me know! I made this for supper today, and it’s amazing! It’s the first of your recipes I’ve tried since I’m new to your blog thanks to Pinterest, and I’m so very glad to have found you! Well, thank you, Mr. Pinterest! And thank you, Lilli! I’m so glad you liked it. Welcome! Is this meal freezer friendly? If so, cooked or uncooked? I’ve not tried freezing it, but I would imagine it would be best to freeze after cooking. I found this recipe tonight while Googling “one pot red beans and rice”. I have toddlers and look for recipes that are easy to make, use simple/on-hand ingredients and taste fantastic. I’m happy to report this was all three. It was so successful I’m buying your cook book (a rarity in these days of unlimited food blogs). I would love to rave more but my little ones are screaming for seconds. It was very tasty, I added a tiny bit of tomato sauce to mine. Sounds like a perfect addition! Glad you enjoyed it! I love your cook book! I havent tried anything yet but tonite im going to try the cheesy rice and corn! 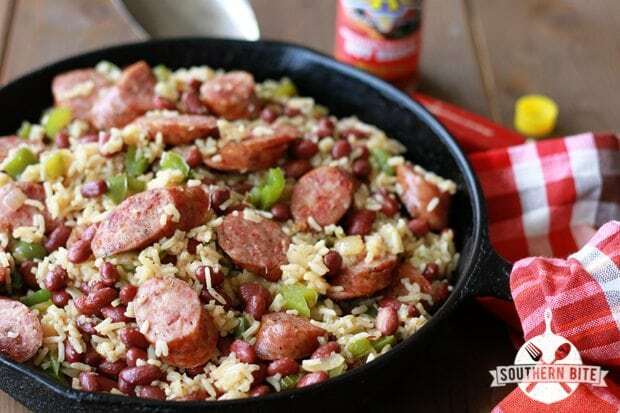 I will also be trying the one pot red beans and rice soon! If yall dont have Stacys cookbook yet, run, and i mean really run, and get it!! I can’t even imagine using instant rice! Having lived in Japan and eating “real” rice every day, I want you to know there is a definite difference in both taste and texture. I have a rice cooker, so would cook real rice and add it to everything else. Great inexpensive rice cookers at Amazon.com. Thanks, Stacey, from a Southern (Texas) gal! This was delicious! It was so easy! I will be making it again! I improvised on the creole seasoning. Do you have a recipe for creole seasoning? So glad you liked it! No, I just buy it at the grocery store. YUMMO! I just made this in no time, and it’s cozy and spicy and yummy! I used Penzey’s “Cajun” spice and smoked andouille chicken sausage. Perfect one-pot dish for a rainy night in VA. SO glad you enjoyed it, Brett!! This sounds delicious – except for one thing. You are really using instant rice in this? Really? I think of it as imitation rice and the real thing does not take long to cook, so why go for the tasteless stuff? I’ll try to substitute Uncle Ben’s for the instant stuff. Yep! Feel free to make whatever substitution you like, but this is the way I do it. Instant rice is simply regular cooked rice that has been cooked and dehydrated. I’m at a complete loss on how much creole seasoning to use. Can you suggest a starting amount? Start with 1/2 teaspoon and increase from there. Good luck! Ha Ha, had no idea on amt of creole, so started with 1/2 TABLESPOON and actually added a little more. I made this tonight and we all loved it! My dad lives with us and can not eat anything spicy so I did not use the creole seasoning. Hubby wanted a little spicy-ness so we added a bit of rotel to it. It is definitely a keeper recipe! Thanks so much. P.S. I used regular white rice instead of instant– it took a bit more moisture but turned out GREAT. Oh my! I searched Pinterest for Red Beans and Sausage and yours looked the best, so I made it tonight. IT.WAS.AMAZING! And SO easy!! Now, I’m off to see what other goodies I can find here on Southern Bite! Fantastic, Sherry! I’m just tickled y’all enjoyed it! I hope you’ll find lots more you enjoy just as well! I sure hope you enjoyed it!! Found this recipe on Pinterest, and OMG…. the smell in my house smells fabulous. I am really not a fan of red beans and rice, but the picture looked wonderful. I can’t wait to taste it!! I hope it tasted as good as it smelled! Here’s a crazy question, but I have NO IDEA what Creole Seasoning is! Help! This is definitely one of my go to meals during the week when my kids have their extracurricular activities. I also serve cornbread on the side that my daughter crumbles and adds it. It’s actually good that way as well! Thanks for sharing! Very big fan of your recipes and your book! Thanks so much!!! So glad it’s turned into a regular at your house! Found via pinterest. Exactly what I needed today for a quick meal. Hot and ready for my hubby when he walks in today. I just threw in some seasonings I had on hand ( cumin, oregano, smoked paprika, and some taco seasoning mix.) I think it turned out great. Fastest and tastiest recipe for this dish that I’ve tried. Thanks for sharing. I sure hope you and your hubby enjoyed it! Do you know the calorie break down for this and serving size? I just don’t keep up with that stuff. There are some great sites out that where you can put in the ingredients and it will figure it out for you. Good luck! I just found this recipe, and it was great! I only had one can of kidney beans so I added a can of black beans as well. I also cooked the rice separately (my boys have to mix it themselves) so left out the chicken broth. Thanks for sharing; even my child who doesn’t like smoked sausage gobbled it down! So glad y’all enjoyed it!! Love this recipe 🙂 love from the Netherlands! Saw this on Pinterest. Love red beans and rice but not happy with what I’ve tried. I improvise a lot when I cook, so I took the liberty of changing this a bit to my husband’s taste. Had Jalapeno beef sausage in the freezer so used that. Added crushed red pepper as well – not much. Added smoked paprika and Tony Chacere creole seasoning. I also don’t cook with minute rice so the closest I had was a box of Yellow Rice and some Arborio pasta. Both equaled the 2 cups of rice. I only had one can of chicken broth so added more water. The yellow rice had seasoning it so didn’t feel I needed more spices. This was fantastic. I know your original recipe would have been great too, but we both like spicy and my husband likes extra spicy. Thanks so much for posting this. A keeper for sure and I am passing along to my kids who don’t like too spicy!! Mahalo! from Texas. Hi Karen! I’m so glad you all enjoyed it!! Love that you made it your own! I made a couple of changes due to ingredients on hand but I loved the simplicity of it and how fast it came together. I used black beans because for some unknown reason I had 10 cans of black beans but not one of red. Then I used brown rice that I precooked 1:1 while sautéing the veggies, and when added to the pot it finished cooking in the broth. I also added 2 bay leaves. Hope you find lots more you enjoy!! How could i substitute uncle bens rice instead of instant rice would I have to add more water?? How much?? Are you talking about Uncle Ben’s parboiled rice? Is this weight watchers friendly? Hi Anne! Unfortunately, that’s not something I calculate. Hi Stacey. I tried this for dinner a few days ago and it was delicious. My kind of meal – quick, easy and only one pot! I’ll definitely be making this again. Thanks! Awesome! I’m so glad you enjoyed it!! I am going to a pot luck dinner and wanted to make red beans and rice but there is no way to keep the rice hot and not sticking together by the time I get there (1hr and 50 minute drive) now I know that I can do it your way. Thanks, problem solved. Yes! This should work perfectly for you! Hope y’all enjoy! Great tasty meal, thank you! I used normal rice as instant rice cost a lot here. I pre cooked it and added it towards the end. And I used a regular basic pot. It all worked very well, my husband and I really enjoyed this meal! Wonderful, Kelly! So glad to hear you enjoyed it! I love hearing that, Kim! So glad one of my favorites has become one of your family’s favorites too! Been using this recipe for years. Love it! So tasty, easy, and fast! Prepared this dish today and it tastes great. Since I didn’t have canned beans, I soaked dry red beans last night to prepare for cooking today. I cooked them in the chicken broth and added a cup of water just until tender. This was the only modification that was made and it turned out perfectly. 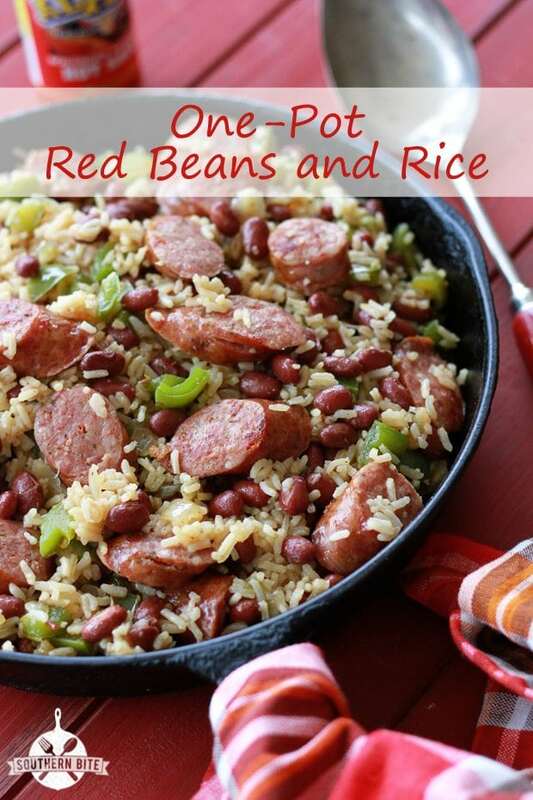 My husband loves red beans and rice and this recipe is definitely a keeper. Thanks so much for sharing. I made this and it was so yummy! I used Zatarains Jumbalaya rice that comes with great Creole seasoning and that made this dish even better! What a GREAT idea! So glad you enjoyed it!! I made this last night, but messed up. I guessed on 1 tsp of cajun seasoning, but added it with the broth. It wasn’t very flavorful. I sprinkled more on the top after it was done, and stirred it in, but still not what I was expecting. We did like it though, but now I’m still worried about how much seasoning to add when I put it in at the proper time. Did bringing the seasoning to a boil take away the flavor? I used regular smoked sausage as I have lil ones eating, and the smoke sausage was definitely the overpowering flavor in each bite. My 19 mo old daughter LOVED the rice and beans, not so much the sausage though. This is one of my family’s all-time favorites! We make it on weeknights, I take it to pot-lucks, we take it to friends when they have a new baby…our GO TO recipe. THANK YOU! So wonderful to hear! So glad you’ve gotten so much milage out of this one, April! Is the measurement of the rice cooked or uncooked rice? Thanks so much for yet another great recipe, Stacey! Your delicious and easy recipe is now my “go to” Red Beans and Rice and I make it regularly! Ha! You are so welcome!! I’m just tickled you’ve found another you enjoy!! How do you know how much creole seasoning to use? I’m making this tonight!! It really depends on the salt content of your seasoning and how much heat you like. I’d just add little by little until you get it where it tastes good to you. I came across this recipe in Pinterest awhile ago but didn’t have any Creole seasoning. I bought some on my next trip the grocery store but didn’t make until tonight. OMG, it was delicious! It ended up being a two pan dish, I cooked the sausage and vegetables in one pan then put everything into my rice cooker. Turned out perfect! Thanks much for the great recipe…it’s a keeper. BTW, I used 2 teaspoons of Creole seasoning…had a little bite but not spicy. Perfect! I’m so glad you enjoyed it, Treena!! Just got finished eating this, and it’s a keeper! My husband and I love it, and I also love how easy it was to make! Thank you for this recipe, they never disappoint! Love hearing that!! Thanks, Melissa! 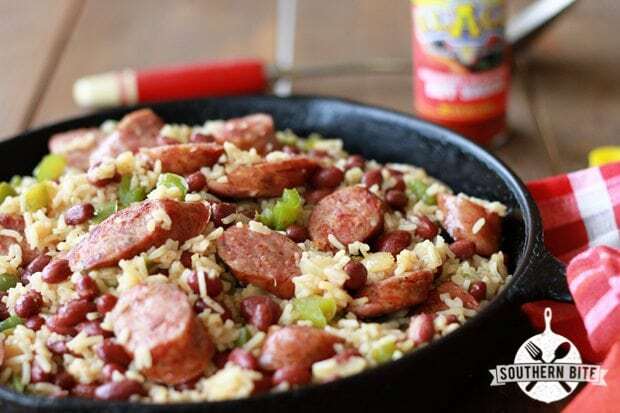 Stacey, I’ve always wanted to try some Cajun style recipes & this was a really good one❗️Deeeeelish❗️Made exactly as you directed using Andouii sausage (I used 2 packs – hubby likes it meaty). Gotta admit it was pretty spicey (hot). But sooooooo good. I was leery using the Creole spice but reading the label showed no “weird” spices so I used 2 tsp. I also prefer long grain rice so cooked it separate & added @ the end. Made a huge pot which we ate for days & hubby took a dish to work. I’m So glad y’all enjoyed it, Jackie! It’s definitely one of my favs!! And you be sure to upload your picture on my Facebook page!!! I’ve made this recipe at least once a week for the past year, it’s my 3 year olds favorite meal and an all around family fave! I pack it with extra veggies (matchstick carrots and riced cauliflower) and use instant brown rice and turkey Polska kielbasa or ground turkey to try and make it a little healthier sometimes! Thank you for providing an easy one pot yummy meal! So glad you’ve gotten some GREAT use out of this one!! Thank you so much for this recipe- it was delicious, and all the kids loved it (even the 1 year old!). This is a delicious meal! Can I use only one can of beans instead? It seemed like there was way to much bean and getting my husband to eat beans is like pulling teeth. Sure! That shouldn’t be a problem. Glad y’all enjoyed it!